With a little understanding of the feline “way,” you’ll discover their behavior isn’t so strange after all. via Cat Behavior 101 | petMD. via How much Kitty Vomit is too much? – VetzInsight – VIN. At those times, knowing that I could have saved their beloved cat’s life had I examined him a month or week or even a day earlier is difficult for me to face and heart-wrenching for the owner. via Cat Illnesses: Symptoms to Watch For. Cat guradians often don’t realize that problems can develop slowly and cats don’t show symptoms until a disease is already advanced. via 10 Subtle Signs Your Cat May Be Sick – The Conscious Cat. Undoubtedly, feline bad breath and its primary cause, feline dental disease, is the area of cat medical care that has been the most frustrating to me during my 20 years as a cat doctor. via Feline Bad Breath: What It Means. via Ask a Behaviorist: 3 Common Myths About Cats | Catster. As your cat gets older, you may notice your once snuggly, loving friend becoming a bit more reclusive. via Does My Senior Cat Hate Me? | petMD. Both types of destructive behavior can lead to problems with other organs, such as the stomach and intestines, if left untreated. via Destructive Behavior in Cats | petMD. 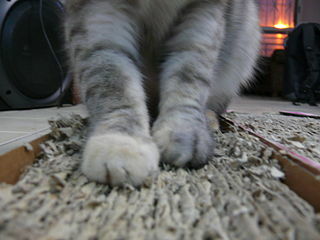 Scratching behavior is considered part of the cat’s normal repertoire of behavior patterns. While scratching allows for the removal of the claw sheaths, it is also an important means for visual and chemical communication. via Understanding scratching behavior in cats | Cat Health News from the Winn Feline Foundation. The authors performed a randomized blinded study on 19 cats, following a crossover design to test the effects of synthetic feline interdigital semiochemical (FIS) on the induction of scratching behavior in cats. via New pheromone can modify scratching behavior of cats | Cat Health News from the Winn Feline Foundation.